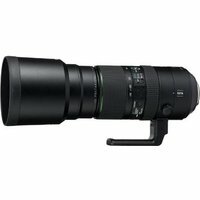 The Pentax 150-450mm f4.5-5.6 ED DC AW D-FA HD is a super-telephoto zoom lens with all-weather construction designed for shooting a wide range of topics, including sport, portraiture, aviation and wildlife. This Pentax K-mount lens for digital SLR cameras is compact and light enough to use freehand without a tripod. High-grade HD Coating, three ED (Extra-low Dispersion) glass elements and a super-low dispersion glass element reduces chromatic aberration and ensure sharp, high-contrast images across the zoom range.